These instruments offer an incredible aperture-to-price ratio. The Dobsonian mount, popularized by John Dobson in the late 1970s, is a very simple but effective method of mounting a Newtonian Reflector, based on the alt-azimuth principle. Fast and easy to set up, the Dobsonian mount consists of a box-type mounting which allows the telescope to pivot in altitude, while the box itself is rotated on a base in azimuth. The secret of the design is to correctly balance the optical tube and to use frictional materials, which allow it to move easily when nudged but to stay in position when not. The mount is designed to be driven by hand as opposed to slow motion controls. Sky-Watcher Dobsonians feature a unique patented Tensioner/Carrying handle. By lifting the handles together, you can easily carry the whole unit in an upright position with the help of a friend. 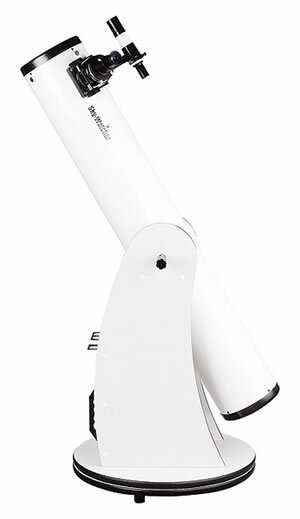 This 6-inch Dobsonian is an ideal first telescope for an older child or adult. Suitable for planets and deep-sky objects. .The Skyliner was a joy to use."